Sauropod communities in the Upper Jurassic of North America include four or five sauropods that co-existed, all feeding on the various plants of the time. The most common of these animals were Diplodocus and Camarasaurus. The immense size of sauropods presents an interesting ecological problem: how did the sauropods share food resources? If several species had to compete for the same food resource, it is likely that one or more would have gone extinct in the territory that the sauropods shared. The obvious place to look for clues is in the mouths of these animals. The dentitions of sauropod dinosaurs include two basic tooth types; a robust, spatulate tooth form, exhibited by Camarasaurus (see skull at lower left), and a gracile, peg-like tooth form, seen in Diplodocus (see skull below right). Based on these dentitions, it has been inferred that Diplodocus ate soft, aquatic vegetation, or that its teeth were used for nipping or raking the fronds of terrestrial vegetation, while Camarasaurus ate tougher vegetation. Experimental work on the microscopic wear patterns on the teeth of modern mammals has provided insights into the diets of extinct animals, including sauropods. Examination of the teeth of Diplodocus and Camarasaurus reveals two basic patterns of wear: a coarsely scratched and pitted surface, and a finely scratched surface. The coarser pattern is present on Camarasaurus teeth, although finer scratches also occur. 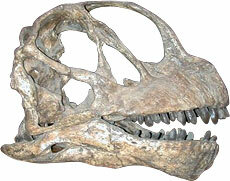 The fine scratch pattern is on the teeth of Diplodocus and in some cases the teeth of Camarasaurus. From left, side view of Camarasaurus skull (from the Smithsonian's Natural History Museum, Washington D.C.), front view of Diplodocus skull (from the Chicago Field Museum), and side view of Diplodocus skull (also from the Smithsonian). Photos © Richard Harwood, Black Hawk College. These two different patterns of microwear present two possible interpretations (see closeups below). 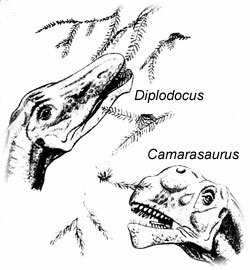 First, Camarasaurus and Diplodocus may have eaten different foods. Considering, however, that there is some overlap in scratch morphology between these two animals, it is reasonable to infer that there may have been some degree of dietary overlap between these sauropods. Left, closeup of Camarasaurus teeth (Smithsonian), and right, closeup of Diplodocus teeth (Chicago Field Museum). Photos © Richard Harwood, Black Hawk College. Alternatively, increased amounts of grit (wind-blown particles) in the diet of Camarasaurus may account for the increased wear on its teeth compared to Diplodocus. Grit may be the dominant influence on the type of wear pattern observable on teeth. The amount of grit taken in by an animal feeding is obviously related to browsing height; therefore, Diplodocus may have browsed at a higher level than did Camarasaurus. Additionally, differential browsing height may be inferred by an examination of the back of the skulls of Camarasaurus and Diplodocus. The occipital region is deflected downward at a much greater angle in Diplodocus than in Camarasaurus, suggesting that the skull of Diplodocus was carried at a higher level than that of Camarasaurus. There are, however, reasonable anatomical and physiological constraints on inferring excessively high levels of browsing for these sauropods. There is little evidence to support one hypothesis more than the other. However, microscopic examination of the wear patterns on the teeth of these two sauropods does indicate that sauropods did feed somewhat selectively, contrary to previous thinking. Coombs, W. 1975. Sauropod habits and habitats. Palaeogeography, Palaeoclimatology, Palaeoecology v. 17, pp. 1-33. Upchurch, P., P.M. Barrett, and P. Dodson. 2004. 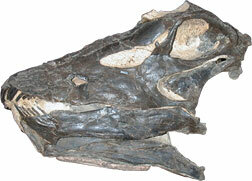 Sauropoda. In The Dinosauria, 2nd edition. D. Weishampel, P. Dodson, and H. Osmólska (eds.). University of California Press, Berkeley. Pp. 259-322. Fiorillo, A. 1991. Dental microwear on the teeth of Camarasaurus and Diplodocus: implications for sauropod paleoecology. In Fifth Symposium on Mesozoic Terrestrial Ecosystems and Biota, Z. Kielan-Jaworowska, N. Heintz, and H. Nakrem (eds.). Paleontological Museum, University of Oslo. Pp. 23-24. Fiorillo, A. 1994. Time resolution at Carnegie Quarry (Morrison Formation: Dinosaur National Monument, Utah): implications for dinosaur paleoecology. Contributions to Geology, University of Wyoming, Laramie v. 30, pp. 149-156.